Bring your photography skills to higher levels by joining this 12-day summer workshop chasing the light of the midnight sun around Iceland. If you want to capture and experience varied and stunning volcanic landscapes in the company of professional photo guides and fellow photography enthusiasts, this is an adventure not to be missed. The midnight sun is a phenomenon of the Arctic night sky, when the sunlight perpetuates throughout the night, creating a golden glow and some of the most fantastic photo opportunities you have ever encountered. Your experienced guides are professional nature and landscape photographers who will share their expertise on how to best capture the elusive and magnificent landscapes of the land of ice and fire. Be prepared to get up early and stay up late, forever bathed in light, travelling around the country to its most revered locations of the South Coast, Snæfellsnes Peninsula, Lake Mývatn, East Iceland and Vatnajökull National Park―meals, lodging and transport included. The subjects at hand are astounding; ranging from black sand beaches and lava fields to glacier lagoons, nature reserves, volcanoes and waterfalls. This season is also when the North Atlantic Puffin is busy nesting all over the country, enabling you to visit lively seabird colonies for fantastical wildlife photography. 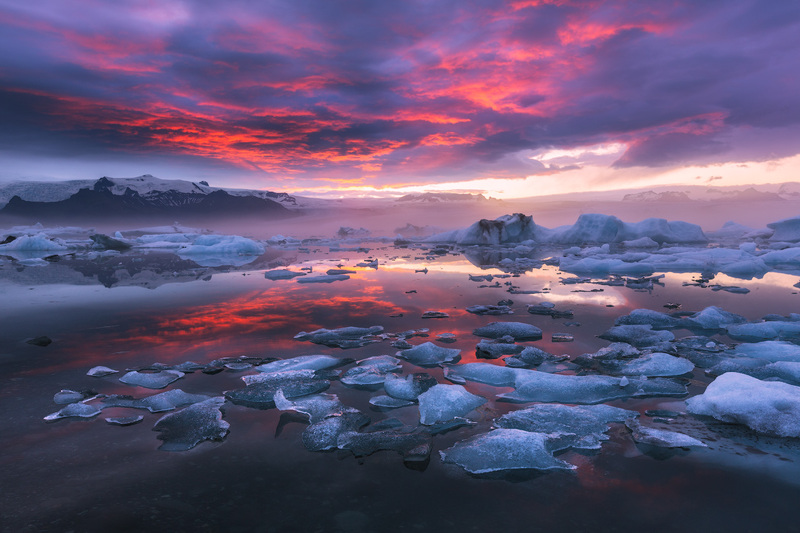 Don’t miss out on this incredible adventure of embarking on a professional photo workshop around Iceland during the period of the midnight sun; participating in an annual excursion during an unforgettable journey. Check availability by choosing a date. Pickup time : 19:00, Flexible. Pickup and drop off at Keflavík international airport is included in this tour. The buses leave regularly from the airport to the capital, simply present your voucher to the driver. After you sign up, you'll receive a recommended camera gear and packing list. Please pay special attention to things that are labelled as absolutely required. For the first day of this twelve-day photography workshop, you will land at Keflavík International Airport and take the Flybus to the capital city of Iceland, Reykjavík. You will then meet your expert photography guides, who will take you out to dinner to run over the plans of your upcoming adventure and to answer any questions you may have. You’ll spend the first night at a hotel in Reykjavík. On day two, you will be picked up from your hotel in a comfortable minibus and start your adventure. Your destination is the Snæfellsnes Peninsula, often called Iceland in Miniature due to the many, diverse sites that can be found here. You have countless subjects to shoot throughout the day. 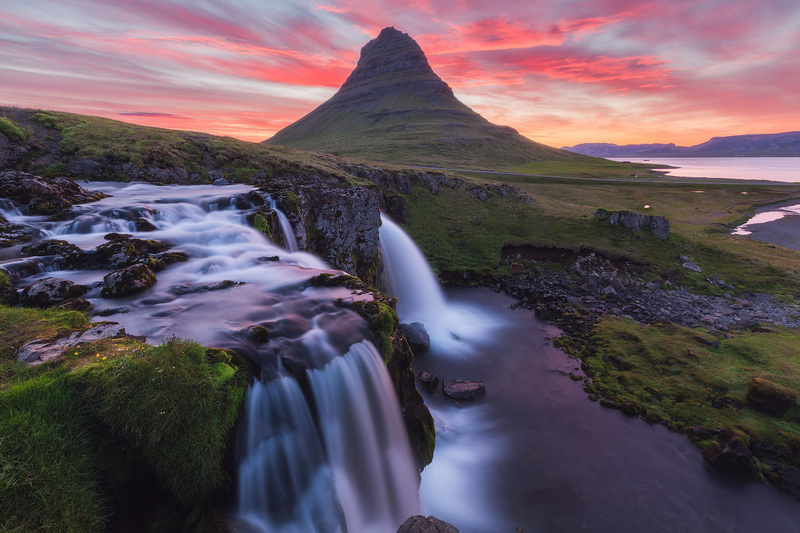 The peninsula’s coastline is rocky and dramatic, with some beautiful geological formations; the lava fields are haunting and magnificent; the villages, such as Buðir, have a mystical air of abandonment; and of course, you will be able to capture the crown jewel of the region, Snæfellsjökull glacier. Plenty of time will be spent at each incredible site, and your guides will be on hand to help you with your technique from the get-go. You will retire for the night in the fishing settlement of Arnarstapi, no doubt taking some photos of its quaint buildings and the basalt columns along the shore before you do. Due to the sheer wealth of sights found on the Snæfellsnes Peninsula, you will spend your third day continuing to photograph and explore it. Sites such as Lóndrangar, two ancient volcanic monuments that tower above the coastline, and Rauðfeldsgja, a dramatic mountainside cleft, beg to be pictured, and promise to make some excellent contributions to your portfolio. The highlight of today, however, will most likely be Mount Kirkjufell. Often called ‘the most photographed mountain in Iceland’, this standalone peak can be shot from many different angles. In the orange shades of the midnight sun, it becomes even more beautiful, so you will no doubt want to shoot here long into the night. As you capture the sites of the Snæfellsnes Peninsula, be sure to keep an eye out for animals to improve your wildlife photography. Many species of birds nest in the craggy peaks and the seas and beaches are home to charismatic seals. You will spend a second night on the peninsula. On your fourth day, you will begin your journey north. Your main destination of the day is the Vatnsnes Peninsula. The Vatnsnes Peninsula and area around it is renowned for its wealth of animal life. The green fields you will travel through en route will be home to hundreds of Icelandic horses, the nation’s most beloved animal. Their friendly, curious nature makes them wonderful subjects. The shores of the peninsula itself are home to even more seals than the Snæfellsnes Peninsula, allowing you to shoot them frolicking in the water or relaxing on the beach. It is not just wildlife photography that draws people to Vatnsnes; the area boasts fantastic sea views that, in clear weather, reveal to you the distant flat-topped mountains of the Westfjords, making for the perfect backdrop. Your final stop for the day is at one of Iceland’s most photogenic features, the Hvítserkur rock formation. This structure has been compared to a drinking dinosaur, elephant and dragon due to its unusual shape and position just offshore, but according to folklore, is, in fact, a petrified troll. You will have plenty of opportunities to shoot this 15-metre-tall landmark beneath the midnight sun before retiring in the area. On day five, you will head to one of the most scenic and popular regions of north Iceland: the Lake Mývatn area. The waters here are beautiful and serene, home to a range of flora and fauna, and dotted with fascinating geological structures. Those eager to capture photographs of birds will find Mývatn an absolute delight. The area, however, has far more features than just the lakes themselves. Nearby is the dramatic Namaskarð Pass, where smoke billows from fumaroles across a barren landscape, dying the earth around them with strange and vibrant colours. There are also many dramatic lava fields and craters that beg to be photographed. If your group is so inclined, you can also spend some time rejuvenating your mind, body and soul in the beautiful waters of the Mývatn Nature Baths. After shooting this incredible area beneath the midnight sun, you will get a well-deserved rest in local accommodation. On your sixth day, you will continue to shoot the sites around Mývatn, returning to certain areas, such as Namaskarð, to capture them under different conditions. You will also travel to a few new destinations. Goðafoss waterfall is a spectacular feature, more than earning its title ‘the Waterfall of the Gods’ (although it should be noted that it is called this for historical reasons, not for due to its otherworldly beauty). Your guides will help you capture its majesty from several different angles. You will then reach a lesser-known but just as stunning waterfall, Aldeyjarfoss, which is surrounded by unique and dramatic hexagonal basalt columns, to shoot it beneath the midnight sun. You’ll spend a second night in the Mývatn area. On day seven, you will leave the north to head into the beautiful and remote East Fjords. Before doing so, however, you will travel through the northern section of the Vatnajökull National Park to shoot one of Iceland’s most dramatic features. Dettifoss waterfall is the most powerful waterfall in Europe, falling 45 metres from a 100 metre-wide cliff. Ominous and awe-inspiring, the surrounding grey rocks make it a subject that speaks of Iceland’s stark, barren yet beautiful natural landscapes. 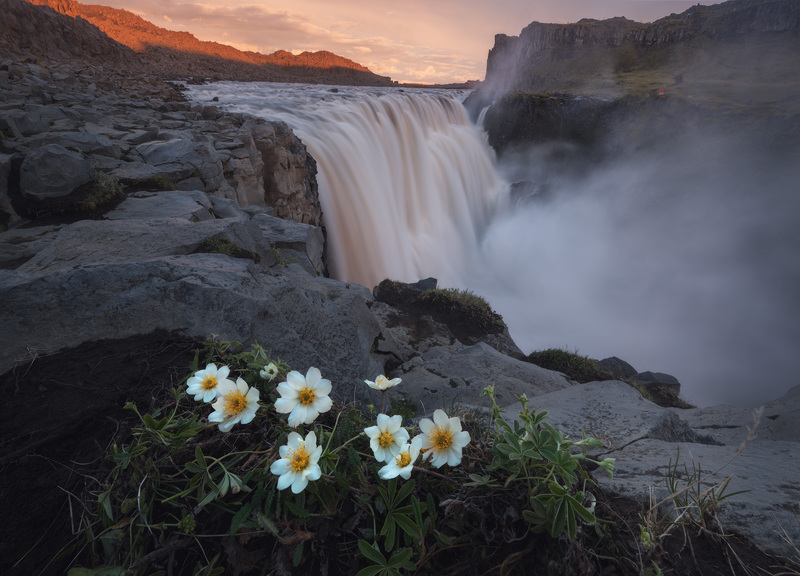 If you have time, you will also have the chance to visit the nearby waterfalls of Selfoss and Hafragilsfoss. After leaving the National Park, you will be enveloped into the beauty of the East. Enormous mountains, deep fjords, glacial landscapes, tiny settlements and incredible views of the ocean define this region, and due to the remoteness of the area, you will be able to shoot it all without fearing other travellers getting into your frames. East Iceland also has a wealth of seabirds living in its cliffs and is the only place in the country where you have the possibility of spotting and photographing wild reindeer. Finally, you will arrive in the village of Djúpivogur, where you can capture its harbour, public artworks and surrounding nature before getting some rest. For days eight and nine, you will explore the incredible southeastern corner of the Vatnajökull National Park, home to some of the most incredible and popular attractions in the country. Jökulsárlón is, without a doubt, the most notable. This vast glacier lagoon is filled with enormous icebergs and home to countless seals, making it an absolute delight to shoot for wildlife and landscape photographers alike. Adjacent to it is the spectacular Diamond Beach, where these icebergs wash up, which is renowned for its stark contrasts in colouration, with the black sand, blue ice and white surf. It is particularly stunning beneath the warm lights of the midnight sun. You will also visit Vestrahorn, a dramatic mountain by the coast, renowned for its twin peaks and unusually dark colouration. Your guides will help ensure your pictures reflect its dramatic appearance. Finally, you will get to shoot at the Skaftafell Nature Reserve. This pocket of Iceland’s nature holds a wealth of incredible beauty, with sites such as glacier tongues, lagoons, lava fields, rivers, and waterfalls, the most notable of which is the spectacular Svartifoss. After a full day (and a good chunk of the night) shooting these marvellous attractions, you will retire in the area. On day nine, you will continue to make the most of your opportunities to shoot these fantastic attractions. You will no doubt be incredibly grateful for the extra hours here, as Jökulsárlón, Skaftafell and Vestrahorn truly are some of Iceland’s most spectacular sites. You will also be able to capture them at different parts of the day, under different conditions, to provide you with as many chances to improve your portfolio as possible. You will spend a second night in south-east Iceland. On your tenth day in Iceland, you will be driven to the southernmost village in the country, Vík, to shoot its spectacular coastline under the midnight sun. En route, you will have a chance to photograph the dramatic glacial tongues creeping from Vatnajökull, the largest ice cap in Europe. You’ll also have a shoot over the almost alien moss-coated lava field of Eldhraun. Once at Vík, you will head over the dramatic Dyrhólaey cliffs, where you can shoot a spectacular rock arch that curves out into the ocean, large enough to boats to sail through. This is also one of the country’s best puffin watching spots, allowing you to picture Iceland’s favourite bird up close. You main shooting location, however, will be the beach of Reynisfjara. This black-sand stretch of coastline is haunting and beautiful, contrasting spectacularly with the white surf of the powerful crashing waves. The best subjects in the area are the towering rock pillars of Reynisdrangar, also said to be trolls frozen in the sun’s morning light. You will capture as many pictures as you can here under the midnight sun before getting some sleep in Vík. On your final full day of photography in Iceland, you will capture the majesty of the waterfalls of the South Coast on your way back to the capital. The first of these waterfalls is Seljalandsfoss, a particularly unique feature that falls from a concave cliff. This allows you to encircle it and shoot the cascade from behind, allowing for some unique shots. Hidden in a mountainside cleft by Seljalandsfoss is the lesser-known, but equally beautiful, Gljúfrabúi, which pours spectacularly upon an enormous boulder in its own little grotto. Finally, you’ll reach Skógafoss, a classic, powerful waterfall that throws up enormous clouds of spray as it thunders from a sixty-metre-tall cliff. You can approach the falls as close as you dare, and a staircase beside it allows you to shoot it from different angles. Wildlife photographers can get some unique shots of the birds that nest here against the backdrop of the cascading water. As you make the final stretch of your journey back to the capital, completing the ring-road of Iceland, you will have a chance to photograph the beautiful volcanoes of Eyjafjallajökull and Hekla. Day twelve, sadly, is your departure day. If you have a late flight, however, you can use the opportunity to apply your new skills to urban landscape photography around Reykjavík, or else just to take in the city. Make sure you get your Flybus in good time, however, so you can have a comfortable journey marvelling over your spectacular pictures.